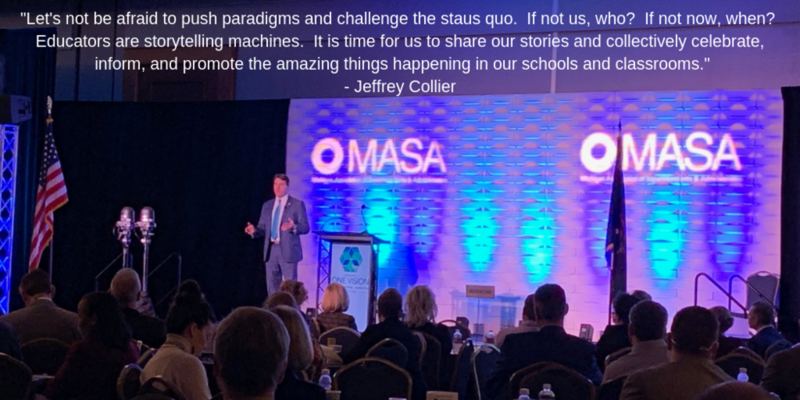 On February 7, 2019, Jeffrey Collier, Superintendent of Au Gres-Sims School District, delivered one of six Ed Talks to superintendents, administrators, and legislators at the Michigan Association of School Administrators (MASA) 2019 Mid-Winter Conference in Detroit, Michigan. Superintendent Collier's Ed Talk was titled: Leveraging Technology to "Brand" Your Schools and Build Dynamic Communication Platforms. He discussed the power of educators to challenge the status quo and lead a positive narrative by collectively celebrating the stories of their successes within schools and classrooms.